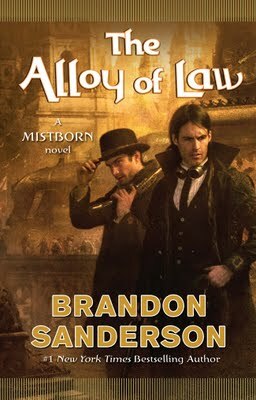 Mistborn fans, here’s the first of six excerpts of Brandon Sanderson’s upcoming novel The Alloy of Law. This promo is being posted by the publisher of this book, Tor books. We’ll bring you more as they come in! The Alloy of Law is set to release on November 8th, 2011. The excerpt is posted below, and it’s a big one, so enjoy! Wax edged around the back of the store, stepping quietly across the red-clay ground. The hillside here was overgrown with weeds except for the entrance to an old cold cellar. Wax wound around it, then paused, eyeing the wood-framed pit. He knelt beside the opening, peering down. There had been a ladder here once, but it had rotted away—the remnants were visible below in a pile of old splinters. The air smelled musty and wet . . . with a hint of smoke. Someone had been burning a torch down there. Wax cocked his gun softly, then drew a little vial out of his mistcoat and pulled the cork with his teeth. He downed the whiskey and steel in one shot, restoring his reserves. He flared his steel. Yes . . . there was metal ahead of him, down the tunnel. How long was this cellar? He had assumed it would be small, but the reinforcing wood timbers indicated something deeper, longer. More like a mine adit. Rust and Ruin, Wax thought. This isn’t Bloody Tan’s lair . . . it’s his gallery. Lessie met Wax’s eyes. They both knew what to do in this situation. Last time, he’d been the one captured. People always tried to use them against one another. In Lessie’s opinion, that wasn’t a disadvantage. She’d have explained that if Tanhadn’t known the two of them were a couple, he’d have killed her right off. Instead, he’d kidnapped her. That gave them a chance to get out. Wax cocked the hammer of his Sterrion and sighted down the barrel. He drew in the trigger until he balanced the weight of the sear right on the edge of firing, and Lessie blinked. One. Two. Three. Wax stood, frozen, horrified. No . . . that isn’t the way . . . it can’t . . .
through long pleated skirts. They called him “Lord Waxillium” or “Lord Ladrian” when they spoke to him. He closed his eyes, taking the air in and out, feeling the faint wetness of the mists on the skin of his face. Buildings are so . . . suffocating here in the city, he thought. Have I simply forgotten about that, or did I not notice it when I was younger? From this vantage, he had a perfect view of the lights down Demoux Promenade. A double row of bright electric lamps with a steady, blazing whiteness. They glowed like bubbles along the wide boulevard, which was flanked by the even wider canal, the still and quiet waters reflecting the light. An evening railway engine called a greeting as it chugged through the distant center of the city, hem- ming the mists with darker smoke. He should be getting back to the party to chat and try to repair House Ladrian’s reputation. But the thought of that crowded room, so hot, so close, sweltering, making it difficult to breathe. . . .
Wax dashed across the rooftop and leaped off, moving toward Demoux Promenade. Just before hitting the ground, he flipped a spent casing down and Pushed on it, slowing his descent. He landed in a patch of decorative shrubs that caught his cloak tassels and made a rustling noise. The city’s size still astonished him. Millions lived here, maybe as many as fivemillion. Nobody had a sure count across all of its wards—they were called octants, and as one might expect, there were eight of them. This portion of the building had been finished already, the exterior of a molded material that imitated worked stone. Ceramics, he’d heard. It was a common practice for tall buildings, where the lower levels would be actual stone, but the higher reaches would use something lighter. Mist swirled beneath him. It seemed almost playful. He looked upward, deciding his next step. His steel revealed lines of blue to nearby sources of metal, many of which were the struc- ture’s frame. Pushing on any of them would send him away from the building. Wax reached into his cloak and removed his short-barreled shotgun from the long, sleevelike pocket inside. He turned—pointing it outward—braced it against his side, and fired. He froze, hand steady, but unable to move. The memories, so carefully dammed up in his head, crashed through and flooded his mind. Lessie, held with a gun to her head. A single shot. Blood on the red brick walls. He tried to fire, but that whimpering . . .
Wax gasped for breath, hand on his revolver. Idiot, he thought to himself. Fool.He’d never frozen in combat before, even when he’d been green. Never. This, however, was the first time he’d tried to shoot someone since the disaster in the ruined church. The stately home lacked expansive grounds, though it did have four elegant stories, with balconies and a nice patio garden out back. Wax dropped a coin and bounded over the front fence, landing atop the gatehouse. My carriage is back,he noticed. Not surprising. They were getting used to him; he wasn’t certain whether to be pleased by that or ashamed of it. He Pushed off the gates—which rattled at the weight—and landed on a fourth story balcony. Coinshots had to learn precision, unlike their cousin Allomancers, Ironpullers—also known as Lurchers. Those would just pick a target and Pull themselves toward it, but they usually had to grind up the side of a building, making noise. Coinshots had to be delicate, careful, accurate. “Um . . .” Wax said, sheepishly removing his hand from inside his cloak. The butler looked back from the candleas. The mansion didn’t have electric lights yet, though workmen were coming to install them soon. Something his uncle had paid for before dying, money Wax couldn’t recover now. Wax hesitated, then slowly pulled his shotgun from its place inside his coat and set it into the trunk beside his bed, placing it beside a companion he’d left there earlier. He took off his mistcoat, wrapping the thick material over his arm. He held the cloak reverently for a moment, then placed it in the trunk. His Sterrion revolvers followed. They weren’t his only guns, but they represented his life in the Roughs. Next postEasy Guide to Checking Out your Favorite Hunger Games Cast Members!